The 1948 Type 356 may be recognised as the first sports car to bear the Porsche name but 50 years earlier Porsche wowed the crowds with a very different vehicle. 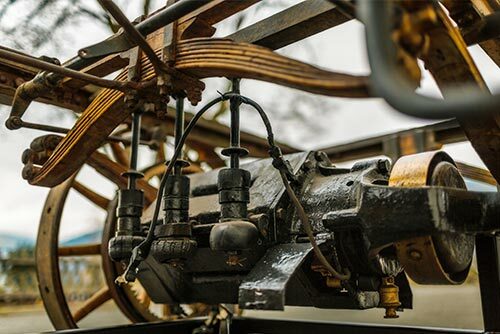 After 116 years, the original, unrestored vehicle has been rediscovered and is set take centre stage at the Porsche Museum as it celebrates it’s fifth anniversary. 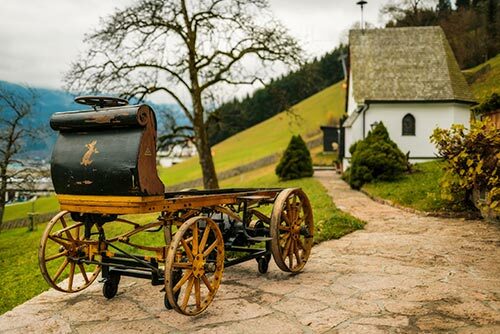 In 1898, Ferdinand Porsche presented the ‘Egger-Lohner electric vehicle, C.2 Phaeton model’, known as the ‘P1’ for short. The ‘P1’ – was one of the first vehicles registered in Austria, taking to the streets of Vienna for the first time on 26 June 1898. Designed and built by Ferdinand Porsche, he engraved the code ‘P1’ (standing for Porsche,number 1) on to all of the key components, giving the electric vehicle its unofficial name. The P1 was packed with innovative ideas that remain remarkable even today (as you may expect from the mind of Ferdinand Porsche). The highly compact electric drive, weighing just 130 kg, offered an output of 3 hp but For short periods, up to 5 hp could be achieved in overloading mode, this allowed the P1 to reach speeds up to 22 mph (35 km/h). The overall range of the vehicle could span up to 50 miles (80 km), a considerable feat for a vehicle of that period. The Lohner alternating vehicle body, was another innovation that allowed the vehicle to be used in both summer and winter. The first public test the ‘P1’ faced was, prophetically for a Porsche, a race for electric vehicles around the streets of Berlin. On 28 September 1899, Ferdinand Porsche, with three passengers on board, steered the ‘P1’ around the 25 mile route. They crossed the finish line first, 18 minutes ahead of the next competitor. All the more impressive as less than half the entrants reached the finish line due to technical difficulties. The ‘P1’ also scooped top honours in the efficiency test, recording the lowest energy consumption in urban traffic. Funny to think Porsche’s new plug-in hybrid 918 Spyder super sports car follows a tradition that started 116 years ago with the ‘P1’. Five years after the Porsche museum opened in January 2009, the addition of the ‘P1’ sees the Museum rearrange its permanent exhibition. Alongside areas dedicated to Porsche road and racing cars, the ‘P1’ now forms a centrepiece introducing visitors to the ‘prologue’ of the exhibition. On 1 and 2 February, the ‘P1’ can be viewed free of charge as part of the celebrations to mark the fifth anniversary of the Porsche Museum.